Well well. Here we are on March 21st. The Spring Equinox. Hasn’t the year flown by? It seems like only the other day that we had snow and ice, and now the days are longer, the trees are in bud and the Blackthorn is in flower. It seems that spring has well and truly arrived. I’m conscious that I haven’t been on here much lately. There’s a few reasons for this, but they all boil down to the fact that I haven’t done much. You see, I don’t do things just so I can write about them. People sometimes say to me that they couldn’t write a blog because they don’t think they could do enough to fill it. To me, this is putting it the wrong way round. The blog is simply a diary, a record of what you’ve done, and I haven’t done much. Partly it’s because I’ve been busy at work. I’ve just returned from a business trip to Saudi Arabia, for instance (sandstorms, and absolutely no wildlife!) and work does otherwise take up a certain amount of time. Partly it’s because of Mrs BWM’s shift patterns, since when she’s at work in the evenings then I need to stay at home parenting. A lot of it is because young Scarlett is getting more independent-minded. In the old days I could carry her around the fields and she’d be happy with that. She’s now got to the age where she’s less easily impressed and she has the language skills to say ‘No Daddy, I don’t want to go out. I want to watch Thomas the Tank Engine’. Which she does. A lot. Although I still take her out (for educational purposes) we tend to spend more time at the playground, or feeding ducks, or other, more fun, places. So what news is there? Well, there was a dead badger on the road a couple of weeks ago, in the same place I saw the polecat a couple of years ago (see https://badgerwatcher.com/2010/06/27/a-very-much-alive-polecat/). It isn’t safe to stop and look closely, but I haven’t seen a badger here before so it’s a new spot on the map. Finally, I’ve added a new bird to my life list. I work in an office in suburban Surrey, near Surbiton, which is actually more leafy and wooded than you might think. 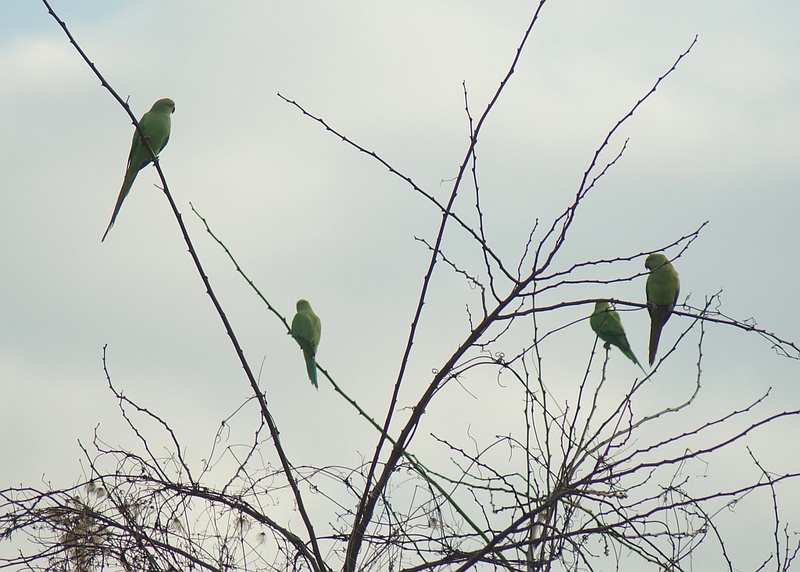 It turns out that our office car park is home to a small flock of a dozen or so Parakeets. Now the days are longer and I’m in the car park in daylight I’ve started to notice them. Parakeets are a naturalised species across a lot of London, and some people complain about them because they can be quite noisy, but I quite like them. They add a bit of colour to the office in more ways than one. I was told that they are descendants of birds that escaped from Henry VIII’s menagerie at nearby Hampton Court. Not sure if I believe that one, but they’re interesting enough all the same.